Ice.com, a domain with a rich history, sells again. This time for $3.5 million. Once a dot-com darling, the Ice.com domain name finds a new owner. Today’s announced sale of the Ice.com domain name for $3.5 million brings me back down memory lane. I remember shopping on the site in the early 2000s. That was in a much earlier incarnation of Ice.com. It was a dot-com darling founded in 1999 (launching in 2000 on Ice.com) that raised about $50 million in funding. Back in 2006, Ice.com bought rival Odimo for $9.5 million. That included $2 million for inventory at $7.5 million for its domain name Diamond.com — making it one of the most expensive domain names ever sold. But Ice.com ultimately didn’t make it. An Austin-based company bought Ice.com for $3.0 million in 2014. They subsequently raised $2 million of investment. That business didn’t work out, either, which leads us to today: an announcement that the domain sold for $3.5 million, making it the most expensive domain name sale of 2018 in what’s shaping up to be a very big week for domain name sales announcements. Brian Harbin from GritBrokerage.com and David Clements from Brannans.com represented the seller and buyer respectively. Ice.com should be donated to “Immigration and Customs Enforcement” to help further their mission to Make America Great Again! 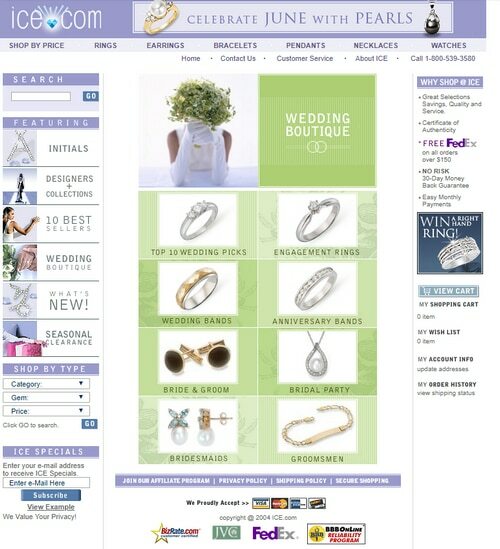 I remember in 2001 I interviewed for a company that ran both Ice.com and other one word .com jewelry sites. The entire job was making the photos of the diamonds way more shiny. All the real photos were dull. I remember them saying they were making the domains look like separate companies so google wouldn’t know. They had some great domain. Generic .com do not lose their value even after the failing of a business model built on them. That’s what you call real and lasting value. It’s like gold, which can be recast into precious jewelry over and over again. Exactly. And like prime commercial real estate, just because one restaurant cannot turn a profit doesn’t mean another restaurant or business establishment will suffer same fate at same location. It ultimately comes down to business operations. Retail, pre-ecommerce, traditionally worked on a 10% overall marketing spend as part of overall budget. A category killer domain, or very easy to remember domain, brings down overall marketing costs tremendously over time. Its up to the rest of the business operations (90% of expenditures) to ensure success. Not solely on shoulders of domain/marketing by a long shot. Great to read a bit of history on the domain and the different companies that owned it. I think the value of the domain has been steady, or more likely even increased because the uses for a domain such as Ice.com are very diverse because of the brand-ability. I think domains like Shoes.com, Diamonds.com or Jewelry.com are worth less today than they were 10 years ago considering the high volume of direct traffic and SEO benefits names like that used to have. That’s why Warren Buffets’s company Richline recently bought Jewelry.com, in addition to being largest shareholder of Verisign? That’s why Walmart paid $9M for Shoes.com two yrs ago? Because they don’t know value? Do you realize how strong of hands these domains are in? Much stronger than Ice.com was or any versatile brandable. You are very ignorant of retail. You are probably a good technologist, but no disrespect, know zero about retail. Nothing to do with SEO. If you want to talk down certain genres of domains at least know what you are talking about. This is a marathon not a sprint. You are correct, I don’t know the retail industry very well. Are you sure those domain names weren’t part of entire company acquisitions? From my understanding none of the two examples you shared are domain name purchases. That would be same as me saying Amazon purchased the Twitch.tv domain name for $970 million. Sorry don’t have time to do DD for you, you’ll have to perform your own. Crypto.com just went for how much? Because of its versatility, not its meaning? Don’t you write the “brandable insider”? No conflict of interest here. Forget about what’s hot (chips, brandables, etc). Stick w fundamentals in long run.